Drax the Destroyer travels the galaxy seeking revenge against those responsible for his family's death. 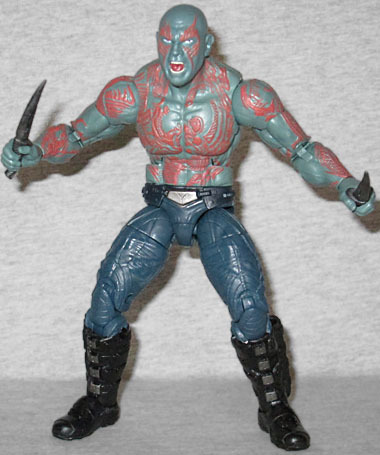 This Drax is quite literally just the first movie Drax with blue pants and a new head. That's it. Well, okay, this time his torso is assembled the correct direction, but the sculpt is identical. That's why this review is being posted on the blog, rather than getting its own page - everything worth saying about the toy was said in the previous review, so we can just direct you there for all the pertient information. Namely, the sculpt is outstanding, the articulation is typically adequate, and his knives fit in his boots well. Plus, he's got blue pants. What's new about him is the head. The previous Drax was a calm, emotionless figure, which didn't really suit the character at all. This one is more furious, his mouth open in a shout. Yes! Bring on the emotions, toymakers! It's a shame the original toy didn't have this head, so that the new one could have the "uproarious laughter" look you know from the trailers. His Build-A-Figure piece is also new, because they couldn't very well still have him coming with Groot's trunk. 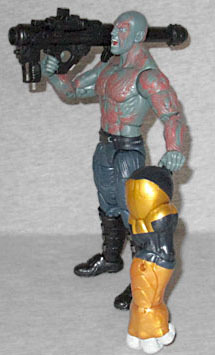 This time the BAF is Titus, and Drax has the left arm. He also gets a new bazooka, for when his knives aren't long-range enough. It's the same model used by the guards at the Kyln, and used by Drax in the Dark Aster. Who cares if it's only from the first movie, or that he can't hold it very well? It's still a fun inclusion. With only a new head, this Drax isn't really a "must-have" from the line. But conversely, if you want to build the Build-A-Figure, you must have him. What a predicament! This entry was posted in blog exclusive review, Hasbro, Marvel and tagged Guardians of the Galaxy, Marvel Legends. Bookmark the permalink.